Add some striking colour to your Patio potsEach Pack Contains 6 Jumbo Ready Plants Great Money Saving Offers... Double Up Again - Order 4 packs of 6 plants and save £10! 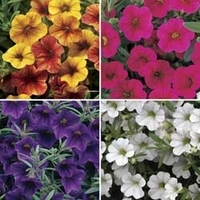 ....... Click Here Petunias have colourful flowers that will bring masses of interest throughout the summer. This Petunia Million Bells Mix has masses of brightly coloured trumpet shaped flowers that will cascade beautifully over the sides of your patio pots. This variety will flower all summer long. See photos of plants from the <a href="/genus/Petunia">Petunia</a> genus in real gardens.